As you may have landed here with thoughts in mind of doing minor revisions to your Orlando or central Florida landscaping or a complete redo of your existing landscaping, or a fresh new landscape for a new home or building, we are experienced and qualified to handle your job no matter what size it is. 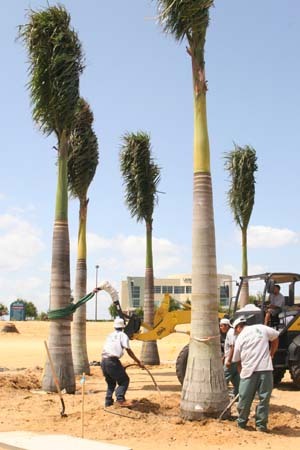 Our landscaping crews are experienced in various job sizes from small residential city lots to large resort landscaping in Orlando and throughout Florida. As you are already researching landscaping companies in Orlando and central Florida, take a few precautionary tips as you narrow your search. Once you have created your short list of companies, you may want to verify their record in the landscaping industry by consulting the Central Florida Better Business Bureau to verify that each company that you are contemplating is compalint free, a little foresight will go a long way with your landscaping project. We are licensed and properly insured, a claim that not all Orlando Landscaping companies can make. Be sure to check the credentials of your Florida Landscaping company to ensure that they hold the proper license and insurance coverage to provide the work that you are requesting. Don't become a casualty of sloppy business practices by unqualified landscaping companies. Once you have created your short list of Landscaping companies in Orlando, you will want to verify that the company that you select for your central Florida landscape project uses quality landscaping materials. 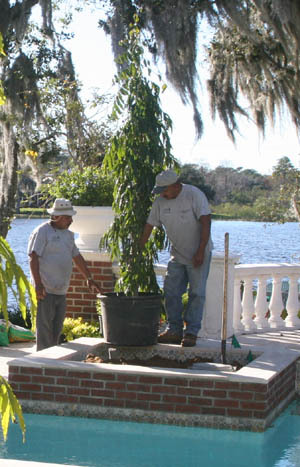 Florida Landscapers are supported by certified Florida nuserymen and the quality plants that they grow and provide to the landscape industry. Although not all landscaping companies obtain their plants from qualified FNGLA growers, at Landscapes by Land Art we select all of our landscaping materials from qualified FNGLA growers to ensure the highest quality product for our clients. Additinally, the State of Florida grades landscaping plant materials for quality, Landscapes by Land Art only installs Florida No.1 quality or better landscape materials. This will result in a long term, healthy landscape that will continually provide you with the best look possible. When plants of lesser quality are used, your landscape may suffer die back, or struggle continually never providing you with the look that you expect. As plants grow in the nursery containers they need care to ensure that they do not become root bound and develop girdling roots. Additionally plants that are grown in nurseries need pruning and fertilization care as well as watering. Some design build operations may have a nursery of their own, where they select neglected plants to install on your property, charging you a premium price for neglected nursery stock. Shall you select us to be your Orlando landscaping company of choice, we will meet with you to discuss your wants and needs. Shall you know exactly what you want or have a landscape plan in hand we will price such accordingly to the specifications that you provide to us. If you are undecided as to what needs to be done to your landscape we may make suggesstions while meeting with you to develop a quick sketch, or you may select to meet with our Landscape Architect, FL Lic no 0001760. and develop a detailed landscape plan that is well thought out and provides exacting details. Please see out DESIGN information for further discussion on landscape design services provided by our professional landscaping design services. Shall you select Landscapes by Land Art as your contractor of choice, and your design issues are resolved, we will provide you with a proposal that will include your landscape clean up, landscape installation, irrigaiton modification or installation and any lighting needs. This proposal will become our "contract" once we have signed it and we will begin work on your project according to the schedule that we will come to in our discussions. The schedule will take into account any deadlines that you have for the work to be completed. We are honest and upfront with our Orlando landcaping clients and will not tell you that we can meet a scheduled deadline if it is not possible. During the installation process you will see our crew clean up your site, while this is going on you may notice that our irrigation crew has arrived and is performing any pre-plumbing or modifications that may be needed. Any paving or hardscape needs will begin to be addressed as the clean up is completed. Simultaneously your landscape lighting will begin to be installed shall you have such on your project. While the hardscape improvements are being completed by our hardscape contractor you will notice that plant materials begin to arrive and be installed. This process will continute until the project is completed. Upon completion of your Landscaping project we will clean up your site, provide the final mulch coverage of your planting beds and ensure that everything is propertly trimmed, pruned, well lit and receiving irrigation as needed. Upon completion of your Orlando landscaping project, we will walk through and present the project to you, explaining any special needs of the plants and materials that have been used to complete your newly installed landscape. 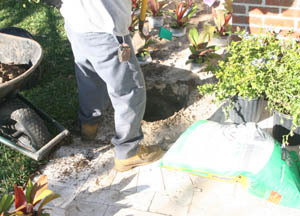 At this time, you may choose to request a maintenance bid from our Orlando Landscape Maintenance professionals. Be prepared to begin receiving compliments and questions regarding your newly installed landsacaping. As we use plants that are not the typical that are seen throught Landscaping in Orlando, you may need to note the names of the plants so that you can pass this information on to people that you may discuss your landscape project with. Of coarse we will leave you with our card so that you may pass those questions along to us shall you forget the plant names, or choose to make a referral. 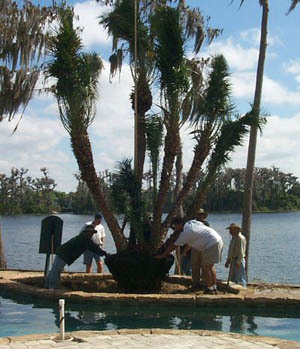 Installation of Royal Palm trees in a Clermont Florida landscaping project.